This paper estimates interfuel substitution elasticities in selected devel�oping and industrialized economies at the sector level. In doing so, it employs state-of-the-art techniques in microeconometrics, particularly the locally .exible normalized quadratic functional form, and provides evidence consistent with neo�classical microeconomic theory. The results indicate that the interfuel substitution elasticities are consistently below unity, revealing the limited ability to substitute between major energy commodities (i.e., coal, oil, gas, and electricity). We .nd that on average, industrial and residential sectors tend to exhibit higher potential for substitution between energy inputs as compared to the electricity generation and transportation sectors in all countries, with the United States being the only exception. In addition, we .nd that developed countries demonstrate higher po�tential for interfuel substitution in their industrial and transportation sectors as compared to the developing economies. The implication is that interfuel substi�tution depends on the structure of the economy, not the level of economic devel�opment. Moreover, higher changes in relative prices are needed than what we have already experienced to induce switching toward a lower carbon economy. Expanding the use of CO2-enhanced oil recovery (EOR) promises to both significantly increase recovery from existing U.S. oil reserves and possibly form a bridge to large-scale CO2 capture and sequestration. An important input into planning for such expansion are estimates of how both the supply of incremental oil and the derived CO2 demand from EOR are likely to vary with the prices of oil and CO2. We demonstrate how the �analog� method of predicting oil and CO2 flows can be used to readily generate such estimates, and apply the method to Wyoming�s Powder River Basin. Russian Gas Imports in Europe: How Does Gazprom Reliability Change the Game? Europe�s dependence on Russian gas imports has been the subject of increasing political concern after gas conflicts between Russia and Ukraine in 2006 and 2009. This paper assesses the potential impact of Russian unreliability on the European gas market, and how it affects European gas import strategy. We also study to what extent Europe should invest in strategic gas storage capacity to mitigate the effects of possible Russian unreliability. The European gas import market is described by differentiated competition between Russia and a � more reliable � competitive fringe of other exporters. The results show that Russian contract volumes and prices decline significantly as a function of unreliability, so that not only Europe but also Russia suffers if Russia�s unreliability increases. For Europe, buying gas from more reliable suppliers at a price premium turns out to be generally more attractive than building strategic gas storage capacity. This paper estimates energy demand in the British domestic and indus�trial sectors and analyzes the extent to which energy-saving technological change is exogenous, or induced by the energy price. The paper implements models with a linear trend, models making use of the price decomposition of Dargay and Gately (1995a) and the Structural Time Series Models (STSMs) of Harvey (1989). Stochastic trends have been found to be rather important while in neither of the sectors assessed in this study could the hypothesis of symmetric price effects be rejected. Following Hunt and Judge (2005), stochastic trend and asymmetric price effects are found to be substitutes in the industrial sector. In particular we con�clude that asymmetric price effects can substitute for the slope in the stochastic trend. Finally, energy consumption in the industrial sector is strongly in.uenced by price while the effect of price in the domestic sector is markedly smaller. We represent the Spanish wholesale market as a supply function com�petition model. Theoretically, the larger generators� supply curves for each plant should be to the left of the supply curves of plants owned by smaller generators. We test this prediction for fuel plants using data from the Spanish Market Op�erator (OMEL) from January 2002 to December 2005. Our empirical results are consistent with the model predictions and suggest that the supply function model better fits data than a discrete-bid auction model since large generators behave as price-makers irrespective whether they are the marginal firms at the auction. We examine the effect of introducing a carbon charge on electricity gen�eration. We model this by way of a two generator Cournot game over a two node electricity network. We find that within the electricity system, emissions of carbon dioxide can increase after a carbon charge is introduced. 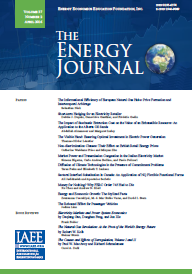 This paper offers an empirical analysis of the impact of reforms in the natural gas industry on consumer prices across the EU-15 area. After briefly reviewing the most recent reforms, we study the relationship between regulatory indicators and price dynamics by means of panel data econometrics. Our findings suggest that so far there is limited evidence of beneficial effects for European consumers from the standard package of gas industry reforms. Using the threshold cointegration methods, Enders-Siklos (2001) and Hansen-Seo (2002), this study finds that spot and futures prices in each of the four widely traded commodities, copper, gold, WTI oil and silver are asymmet�rically co-integrated. However, the asymmetric adjustment to the long-run equi�librium differs among those commodities, reflecting different profitable opportu�nities. The adjustment is faster for copper after positive shocks, while it is faster for the safe havens oil, gold and silver after negative shocks. It is more the spot and not the futures price for the four commodities that focuses in its adjustment on long-run factors. In sum, the adjustments imply different trading strategies, depending on whether the faster adjustment happened from above or below the threshold. Coal continues to play an important role in the global energy sector and with the increase in international trade a global market for steam coal has de�veloped. We investigate market structure and recent price developments with a numerical modeling approach and develop two partial equilibrium models, a quantity based model and a model additionally incorporating energy values. We compare two possible market structure scenarios for the years 2005 and 2006: perfect competition and Cournot competition. Our chief finding is that, for both models, the simulation of perfect competition better fits the observed real market flows and prices. However, we also note that spatial price discrimination and a time lag in the pricing-in of capacity constraints are additional mechanisms in the market. From a modeling perspective, relying only on coal quantities leads to distortions in estimated trade flows, suggesting that an energy-based model is superior.